Introduction The LVIS stent system (LVIS and LVIS Junior) is a self-expanding, retrievable, microstent system indicated for the treatment of wide-necked cerebral aneurysms (WNAs). The present pivotal study was performed to evaluate the safety and effectiveness of this device. Methods The US LVIS pivotal trial was a prospective, multicenter, single-arm, interventional study conducted at 21 US centers. The study enrolled 153 adults with WNAs of the anterior and posterior circulations. The study was conducted under good clinical practices and included independent adjudication of all adverse events. The primary effectiveness endpoint was defined as successful aneurysm treatment with the LVIS System as evidenced by complete (100%) aneurysm occlusion at 12 months on conventional angiography without retreatment and without significant (≥50%) stenosis of the treated artery at 12 months as determined by an independent core laboratory. The primary safety endpoint was defined as the rate of stroke or death within 30 days, or ipsilateral stroke or neurologic death with 12 months. Results One hundred and fifty-three patients enrolled at 21 investigational sites underwent attempted LVIS-assisted coil embolization. The mean age was 58.3±10.5 years and the majority of the participants (110/153, 71.9%) were female. Fifty-seven aneurysms (57/153, 37.3%) arose from the anterior cerebral artery, 43 (43/153, 28.1%) from the internal carotid artery, 17 (17/153, 11.1%) from the middle cerebral artery, 27 (27/153, 17.6%) from the basilar artery, six (6/153,3.9 %) from the PCA, and two from the vertebral artery. A single aneurysm arose from the superior cerebellar artery. The mean aneurysm dome height was 6.0±2.2 mm and mean width 5.5±2.3 mm. Mean neck width was 4.2±1.4 mm. A total of 22 participants presented for re-treatment of a previously ruptured (>30 days prior to treatment) target aneurysm. The primary effectiveness endpoint was observed in 70.6% (108/153) in the intent to treat population (ITT). Of the evaluable participants with follow-up 12-month angiography, 79.1 % (110/139) demonstrated complete occlusion– 92.1% (128/139) in this population demonstrated ≥95% occlusion and 95% demonstrated ≥90% occlusion (132/139). Eight participants (5.2%, 8/153) had at least one primary safety event in the ITT population. Conclusion The LVIS stent system allows safe and highly effective coil embolization of WNAs. The LVIS devices (LVIS and LVIS Junior) are self-expanding, retrievable, microstents indicated for the treatment of WNAs. Previous prospective and retrospective studies have demonstrated favorable safety and efficacy profiles.7–13 The pivotal US LVIS study is an IDE study designed to determine the safety and effectiveness of the LVIS device-supported coil embolization of WNAs located in the anterior and posterior intracranial circulations. Data from this study were used to support a US regulatory submission for premarket approval. This primary purpose of this article is to summarize the safety and effectiveness of the LVIS devices. The pivotal US LVIS study was a prospective, multicenter, single arm, interventional study conducted at 21 US centers. The study enrolled 153 adults with WNAs of the anterior and posterior intracranial circulations. All patients were enrolled between July 2013 and October 2014. The study protocol was approved by each center’s IRB and all patients submitted written informed consent. The study was conducted under good clinical practices and included independent adjudication of all adverse events. An independent core laboratory evaluated all angiographic data and adjudicated effectiveness outcomes. An independent Clinical Events Committee (CEC) adjudicated all endpoints. An independent Data Safety Monitoring Board conducted study safety reviews. A detailed set of inclusion and exclusion criteria are included in the online supplementary materials (online supplementary appendix 1). In summary, the inclusion criteria allowed unruptured or ruptured (>30 days since occurrence) wide-necked (neck ≥4 mm or dome to neck ratio <2) intracranial, saccular aneurysms (≥4 mm and <20 mm maximum diameter in any plane) arising from a parent vessel with a diameter ≥2.0 mm and ≤4.5 mm which the investigator felt were amenable to endovascular coil embolization. The LVIS devices are self-expanding nickel titanium, single-wire braid, compliant, closed-cell implants that can be deployed and retrieved by a single operator using the delivery system (figure 1). The LVIS Junior device (figure 1A) is available in diameters of 2.5 and 3.5 mm and in unconstrained lengths between 10 and 30 mm. The LVIS device (figure 1B) is available in 3.5, 4.5, and 5.5 mm diameters ranging in lengths between 10 and 30 mm. The LVIS Junior device is delivered through a standard microcatheter with an internal diameter of 0.017’ (Headway 17, Microvention/Terumo, Tustin, CA). The LVIS device is delivered through a standard microcatheter with an internal diameter of 0.021’ (Headway 21, Microvention/Terumo, Tustin, CA). These braided microstents provide substantially greater metal surface area coverage (LVIS 23%–27% and LVIS Junior 17%–23%) than do the predicate laser-cut Nitinol hypotube-based microstents (Neuroform, Stryker Neurovascular, Fremont, CA, Enterprise, Codman Neurovascular, Raynham, MA and Solitaire, Medtronic, Irvine CA; 6.5%–9.5%). The LVIS devices: the LVIS devices are self-expanding nickel titanium, single-wire braid, compliant, closed-cell implants that can be deployed and retrieved by a single operator using the delivery system. The LVIS Junior device (A) is available in diameters of 2.5 and 3.5 mm and in unconstrained lengths between 10 and 30 mm. The LVIS device (B) is available in 3.5, 4.5, and 5.5 mm diameters ranging in lengths between 10 and 30 mm. All enrolled patients underwent a standard neuroendovascular procedure with the intent of delivering and implanting an LVIS device across the aneurysm neck. All patients were treated with both aspirin and clopidogrel prior to the procedure with either a loading dose the day prior or daily doses for 7 days prior. All patients were treated with two anti-platelet agents for a minimum of 3 months after the procedure and then were maintained on monotherapy (ASA recommended) for the participant’s lifetime (if no contraindication). Coil embolization was to occur during the index procedure, but could occur before or after stent deployment using any generally accepted strategy (eg, trans-stent coiling, jailing, or balloon-assisted coiling and then stenting). Patients were considered to be ‘enrolled in the pivotal US LVIS trial’ with the intention tof treating when the LVIS device was introduced into the microcatheter during the procedure (whether or not the device was successfully delivered or deployed). Clinical follow-up was conducted at 30 days, 6 months, and 1 year. Conventional follow-up angiography was performed at 1 year. Device success was defined by satisfactory coiling in addition to successful placement of the first stent attempted at the assigned site. Successful stent placement was defined as stable stent placement with complete coverage across the aneurysm neck and parent artery patency. Per protocol safety was assessed at 30 days and 1 year, and effectiveness was assessed at 1-year follow-up. Any safety events which came to attention up to 60 days after the 12-month visit (425 days' post-procedure) were still captured and counted within the 1-year safety endpoint. The primary effectiveness endpoint was defined as successful aneurysm treatment with the LVIS device as evidenced by complete (100%) aneurysm angiographic occlusion at 12 months without retreatment and without significant (≥50%) stenosis of the treated artery at 12 months. The primary safety endpoint was defined as the rate of stroke or death within 30 days, or ipsilateral stroke or neurologic death with 12 months. One hundred and seventy-one patients met initial screening criteria and were consented. There were 18 screen failures. One hundred and fifty-three patients were enrolled and treated at 21 investigational sites. All enrolled patients underwent an interventional procedure with the intention to treat with the LVIS device and coils. These data are included in the ITT effectiveness and safety analysis. The mean age of enrolled patients was 58.3±10.5 years and the majority (110/153, 71.9%) were female. The majority of participants (107/153, 69.9%) had a history of hypertension. Nearly half had a history of tobacco use (75/153, 49.0%) or hyperlipidemia (68/153, 44.4%). Twenty-eight participants (28/153, 18.3%) had a family history of cerebral aneurysm and 39 (39/153, 25.5%) had multiple aneurysms. Thirteen sparticipants had a previous ischemic stroke (13/153, 8.5%) and 15 a previous transient ischemic attack (TIA) (15/153, 9.8%). Thirty-seven (37/153, 24.2%) had a previous subarachnoid hemorrhage. A total of 22 participants presented for treatment of a previously ruptured (>30 days prior to treatment) target aneurysm. Despite the frequency of previous neurologic events, the average NIHSS at baseline was less than 1 (0.6±2.6) and most participants (126/153, 82.4%) had scores of 0 (zero). One hundred and five participants (105/153, 68.6%) had no symptoms (mRS=0) and an additional 26 participants (26/153, 17.0%) had no significant disability despite having symptoms (mRS 1). Thirteen participants (13/153, 8.5%) had a slight disability (mRS 2). Six participants had moderate disability (mRS=3) and only two participants (2/153, 1.3%) had moderately severe disability (mRS=4) prior to treatment. The anatomical locations of treated aneurysms are listed in table 1. The mean aneurysm dome height was 6.0±2.2 mm and mean width 5.5±2.3 mm. The mean neck width was 4.2±1.4 mm. The study included 12 (7.8%) large (>10 mm) aneurysms. The mean parent artery diameters were 2.8±0.70 mm proximally and 2.5±0.64 mm distally – 58.9% (90/153) of the aneurysms treated were located at a bifurcation and over one-third (63/153, 41.1%) were described as side-wall aneurysms. The majority of aneurysms (98/153, 64.1%) treated in this study were found incidentally as part of other clinical evaluations and most had not been previously treated (115/153, 75.2%). Of the 38 aneurysms that had been previously treated, 36 were coiled and two were clipped. The delivery and deployment of a total of 179 devices was attempted in 153 participants. One participant had no device implanted. Three participants had two devices implanted, resulting in a total of 155 devices implanted. Device success – successful placement of the first LVIS device with successful subsequent coiling – was achieved in 143 of 153 (93.5%) patients. Three of the failures were due to suboptimal sizing of the initially chosen device and a second device was successfully deployed. In one of these cases, coiling was ultimately deferred to a later date. In an additional three patients, following successful stenting, coiling was deferred to a later date and successfully completed at that time in two of the three cases. None of the device failures were associated with any clinical or neurological complications. Ultimately, successful deployment of an LVIS device (ie, stent success) was achieved in 149 of 153 (97.3%) patients. Incomplete stent expansion or poor apposition was reported in three cases. In one case, successful coiling was performed without the need for stent assistance. The mode of coils used per case was three and in 81.0% (124/153) of cases seven or fewer coils were used. At least one Hydrogel coil was used in 74 of 151 patients undergoing coiling (49%). The most common technique utilized for stent-assisted coiling was coil placement through a microcatheter, which had been placed into the aneurysm just prior to LVIS placement (‘jailing technique’). This technique was used in 82 (53.6%) participants. Traditional trans-stent coiling was performed in 32% (49/153) and stenting after coiling was performed in 9.2% (14/153). Anticoagulation with unfractionated intravenous heparin was used in all cases. Peri-procedural ACTs were maintained within an expected therapeutic range. Intraprocedural IIb/IIIa antagonists (abciximab (six) and eptifibatide (one)) were used in a total of seven cases (7/153, 4.6%). In four of these cases, the agents were used for angiographically evident intra-procedural thrombus. In the remaining cases, no indication was provided for the intra-procedural administration of the agent. The primary effectiveness endpoint was defined as successful aneurysm treatment with the LVIS device as evidenced by complete (100%) aneurysm occlusion at 12 months, without retreatment, and without significant (≥50%) stenosis of the treated artery at 12 months, all based on independent core laboratory assessments of conventional angiography. Fourteen participants did not undergo 12-month conventional angiography and all of these participants were counted as failures for the primary effectiveness endpoint. Of the participants in the intent to treat population (ITT), 70.6 % (108/153) met the success criteria. oO the evaluable participants with follow-up 12 month angiography, 79.1 % (110/139) demonstrated complete occlusion, 92.1% (128/139) in this population demonstrated ≥95% occlusion, and 95% demonstrated ≥90% occlusion (132/139). No participant (0%) had a documented parent artery stenosis ≥50% on the 12-month angiogram. Less than 5% of the ITT population (six participants) required target aneurysm retreatment – as defined prospectively in the protocol as any additional treatment of the target aneurysm after the original procedure – during the study period. Of the six participants classified as retreatments, only two were ‘classical re-treatments’ in which additional coiling was performed on the basis of a follow-up imaging, which demonstrated residual aneurysm filling. 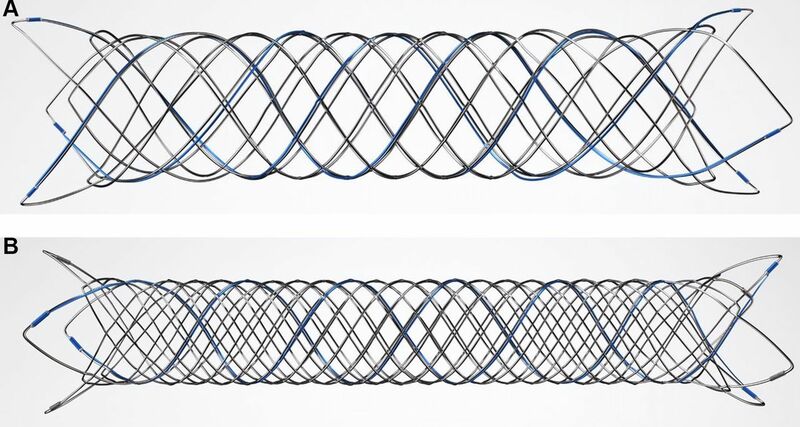 In four patients, after stent placement, the operator decided to stage the procedure with coiling (three) or additional coiling (one) deferred to a later date due to factors encountered during the procedure. The primary safety endpoint was defined as the rate of major stroke or death within 30 days or major ipsilateral stroke or neurologic death within 12 months. Eight participants (5.2%, 8/153) had at least one primary safety endpoint in the ITT population. Two patients experienced major strokes within 30 days of the procedure (2/153, 1.3%). Both patients died. One experienced an ipsilateral parenchymal hemorrhage 7 hours after the procedure, and subsequently died on post-procedure day 2 (0.7%, 1/153, peri-procedural death). The second was found unresponsive 29 days after the procedure. Imaging demonstrated a small subacute thalamic infarct and a (likely) traumatic subdural hematoma with midline shift. The patient ultimately expired on POD 63. One hundred and forty-seven patients were available for clinical follow-up after day 30 (one death, four lost to follow-up, one never stented). Two patients sustained a neurologic death more than 30 days (63 and 393 days) after the procedure (1.4%, 2/147). Three additional patients died of non-neurological (drug overdose, cardiac event, and suicide) causes during the 1 year of clinical follow-up. Three patients experienced a major ipsilateral stroke after 30 days and through 12 months (3/147, 2.0%). Stroke events (both hemorrhagic and ischemic) occurred in 14 patients (9.2%, 14/153) in the ITT population (two patients had both a major and a minor stroke) (table 2). There were 10 major strokes (6.5% 10/153), four of which occurred within 30 days and six occurred between day 31 and 365. Three of the major strokes ultimately resulted in death (as described above). Of the 10 patients experiencing major stroke, four were hemorrhagic and five were ischemic, and one patient had both an ischemic and hemorrhagic stroke. Of the six major strokes that occurred between day 31 and day 365, three were adjudicated as major ipsilateral strokes and were considered primary safety endpoint events. The other three major strokes were not in the vascular distribution of the LVIS treatment. Of the 10 major stroke events, four were judged by the CEC to be either definitely (one), probably (two), or possibly (one) related to the device. Six (including two of the fatal strokes) were adjudicated as unrelated to the device (table 3). Of the six minor strokes (3.9%, 6/153), five were ischemic (5/6), and the majority (5/6, 83.3%) occurred within the first 30 days. The one hemorrhagic stroke was a procedural aneurysm perforation. All six were judged to be definitely (two), probably (one), or possibly (three) related to the device (table 3). The pivotal US LVIS trial demonstrates that the LVIS and LVIS Junior stents, when used in conjunction with coils for the treatment of WNAS can achieve durable, adequate (>90%) occlusion at 1 year in almost all (>95%) patients; can achieve durable, complete occlusion at 1 year in most (~80%) patients; are associated with very low rates of aneurysm re-treatment; and can be used by experienced operators with a high level of procedural safety (~5% rate of primary safety events through 1 year). The neurological and non-neurological complexity and co-morbidities of the cohort of patients included in the study accurately reflects the population of ‘real world’ patients who present for aneurysm management. Approximately 20% of the study cohort had experienced a stroke or TIA and one-quarter had a subarachnoid hemorrhage prior to enrollment in the study. Overall, nearly 15% had a baseline mRS of 2 (8.5%) or greater (5.2%). So it is not surprising that the rate of non-neurological death (3/153) was equivalent to the rate of neurological death (3/153) during the study. Similarly, the rate of major stroke within the vascular territory of the LVIS after 30 days was equal to the incidence of non-ipsilateral major stroke. This provides some important additional context when considering the overall rate (6/153, 3.9%) of permanent neurological morbidity related to ipsilateral stroke (three patients with an increase in mRS to ≥3 at 1 year) and neurological mortality encountered during the study. The advent of microcatheter deployed intra-cranial microstents represented a significant advance for the treatment of WNAs. The first generation of aneurysm neck-bridging microstents, was the Neuroform (Stryker Neurovascular, Fremont, CA), an open-cell, laser cut, Nitinol hypotube-based design.14–19 The second generation of microstents (Enterprise, Codman Neurovascular, Raynham, MA and Solitaire, Medtronic, Irvine CA), were closed-cell, laser cut, Nitinol hypotube-based designs.20 The closed-cell design allowed the operator to resheath and reposition the stent after initiating deployment. At the same time, these closed-cell devices were less conformable, particularly around areas of tortuosity, where the closed-cell structure led to varying degrees of ovalization and vessel wall malapposition in some cases.21–23 The LVIS devices represent the third generation of aneurysm-bridging microstents and have a braided design. The braided structure allows for the device to be resheathed after deployment is initiated and at the same time optimizes vessel wall apposition in tortuous anatomy.7–10 12 13 In addition, the pore sizes of the braided devices are significantly smaller than the respective cell sizes of the non-braided devices, resulting in better retention of smaller coils within wide-necked aneurysms. Finally, the braid delivers a much higher degree of metal surface area coverage over the aneurysm neck, providing a more robust flow diversion effect when compared with the other available microstents and also presenting a potentially better lattice for neoendothelial overgrowth.24 These properties likely account for the very high levels of complete and adequate aneurysm occlusion observed in the present study. WNAs are among the most challenging aneurysms encountered for surgical and endovascular treatment.2 3 6 25 A recent meta-analysis of the existing literature reported a complete occlusion rate of 46.3% (SE 3.6%), an adequate occlusion rate of 59.4% (SE 12.2), and a rate of safety endpoints of 18.7% (SE 2.9) for all therapies.25 The recent BRANCH trial underscored these findings, reporting a core laboratory adjudicated rate of adequate occlusion at follow-up of only 63% for a series of 115 patients with wide-necked, unruptured MCA and BA aneurysms. In the same study, they observed a 6.9% rate of serious adverse events, including two (1.7%) procedure-related mortalities.26 The present series indicates that LVIS-supported coil embolization performs at a level considerably superior to these benchmark values for effectiveness without additional safety concerns. The pivotal US LVIS device trial demonstrates that the LVIS devices are both safe and effective for the treatment of WNAs. The authors would like to thank Philip Lavin, PhD for his contribution to the Pivotal US LVIS Trial as study statistician.
. Stent for treatment of intracranial aneurysms with parent vessel diameter of 2.5 mm or less. Interv Neuroradiol 2018:1591019918759307.
. In-stent stenosis as a delayed complication of neuroform stent-supported coil embolization of an incidental carotid terminus aneurysm. AJNR Am J Neuroradiol 2004;25:1764–7. Contributors All named authors contributed substantially to the work described by actively participating in the study and the generation of the data and providing editorial evaluation of the manuscript. Funding Funding for this study was provided by Microvention Inc. Competing interests The authors have the following potential conflicts with Microvention/Terumo: DF: research support, consulting; AB: speaker’s fees; AST: consulting; AHS: research support, consulting; ASA: research support, consulting; OD: proctor; DKL: research support, consulting. Ethics approval All participating institutions. Correction notice Since this paper was first published online the term LIVS in the title has been updated to read LVIS.